I’m offering this unusual little print for sale via my listings page. Click on the link at the top of the page for further details. It provides an allegorical comparison between the political affairs of France and Britain during the early 1790s. 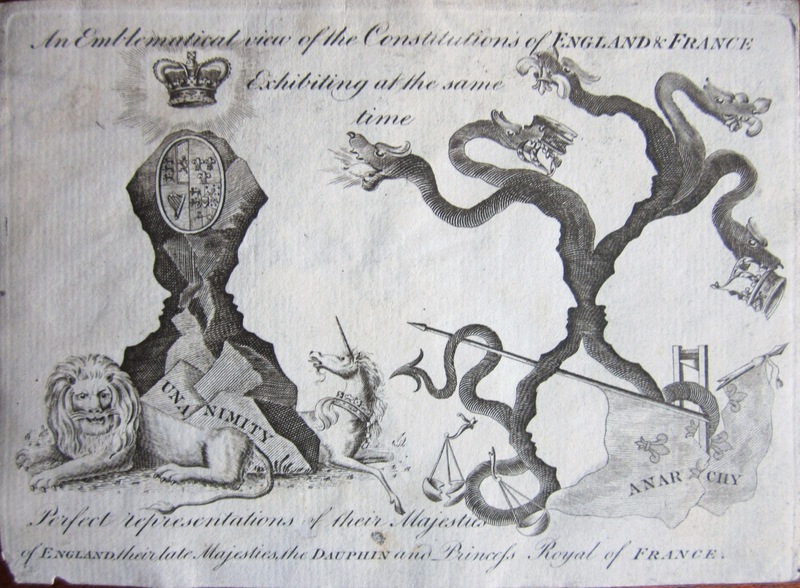 On the left, the British constitution is depicted as a rock surrounded by the symbols of constitutional monarchy and engraved with the word ‘unanimity’. The silhouettes of King George III and Queen Charlotte can be seen on either side of the rock. France meanwhile is represented by a fearsome hydra, whose writhing limbs crush the old French flag and the scales of justice. Four of the creature’s heads are consuming crowns and fleur-de-lis representing the members of the French Royal family, whilst the fifth breathes fire towards Great Britain. Within the body of the serpent it is possible to pick out the silhouettes of Louis XVI, Marie Antoinette, Princess Marie Thérèse and the Dauphin Louis Charles. There’s no date or publication information but the subject matter is consistent with numerous prints which were published in England following the execution of Louis XVI and the outbreak of war with France in early 1793. The print is small, measuring approximately 3 x 4½ inches and was possibly intended to by pasted into pocket book, diary, snuff box, or other similarly-sized item. The Dutch artist and engraver Romeyn de Hooghe (1645 – 1708) has been described as the “first great modern graphic satirist” by the historian Simon Schama, who credited him with a leading role in the creation of a satirical trope which juxtaposed the boisterous libertarian Protestantism of the Northern European states with the stultifying absolutism of the Roman Catholic monarchies. It was a theme which was adopted wholeheartedly by English satirists in the early eighteenth-century and was to a remain common refrain in British graphic satire for the next 150 years, underpinning caricatures such as William Hogarth’s O the Roast Beef of Old England (‘The Gate of Calais’) (1748) to James Gillray’s End of the Irish farce of Catholic emancipation (1805) and beyond. In L’Europe Allarmée pour le fils d’un Meunier [Europe alarmed for the son of a miller], de Hooghe shows James II of England engaged in a plot to forcibly impose Roman Catholicism on his own subjects. The satire takes its cue from rumours that James’s son, James Edward Stuart, was a lowborn changeling who had been smuggled into the royal maternity bed to provide the childless monarch with a means of establishing a permanent Catholic dynasty. James and his wife are shown standing around the royal crib with a motley collection of allies, courtiers and Catholic priests. The Queen is deep in conversation with the despised Cardinal d’Adda, who is flanked by Louis XIV and the Dauphin offering support for a proposed invasion of England. James stands behind the Queen and carries a sheaf of Parliamentary papers and copies of the charters of the English corporations. He appears to be distracted by a Jesuit scholar whispering furtively in his ear, presumably offering advice on the best way to dispense with these institutions and establish an absolute monarchy along similar lines to that of France. A mob of Catholic priests performs an impromptu mass for the phony prince, while the baby’s real mother, the wife of a miller, sits beside the crib and chats with the Queen’s Catholic priest. The priest’s arm rests across hers in a manner which suggests intimacy and hints at the prospect that he is the child’s real father. Behind the crowd of spectators a band of Irishmen caper about manically, blasting trumpets to celebrate the prospect of a resurgent Catholic monarchy. The archways at the rear of the scene opens onto a naval vista showing an invasion fleet disgorging French soldiers onto English shores. The print is undated and it’s unclear whether this was published before, during or immediately after the Glorious Revolution of 1688-89. Edward Hawkins, curator of the British Museum’s Department of Prints and Drawings in the mid nineteenth-century dated it to 1689, but this copy is annotated 1688 in what appears to be a contemporary hand. 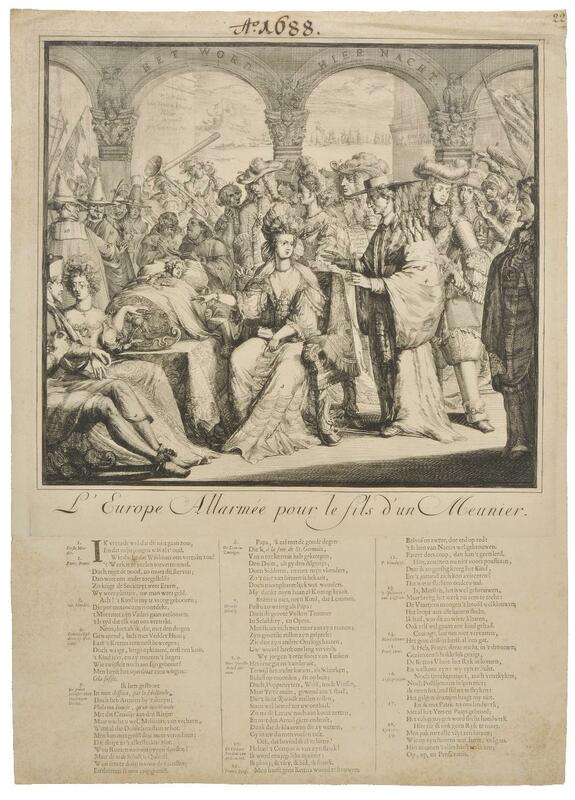 At least two different version of the print were published, one in Dutch and another with French text. The latter was presumably intended for sale beyond Holland (although not necessarily in France), where French typically served as the lingua franca of the educated upper classes. The image was later reworked by an anonymous Dutch artist who changed it into a satire on Britain’s decision to abandon the War of Spanish Succession and conclude a separate peace treaty with France in 1712. Although the image is substantially the same, the royal crib has been replaced with a copy of the proposed peace treaty and the principle characters have been re-purposed as allegorical symbols of peace, victory and war. This version was also issued in Dutch and France (this time combined in a single sheet) and titled Het Hof van Vreede onder de Roos, met de Leli verzoend [The Solitary Court of Peace Between the Pink Rose and the Lily]. Here’s another item that falls outside of the period with which this blog normally concerns itself but is nevertheless interesting enough to warrant a closer look. 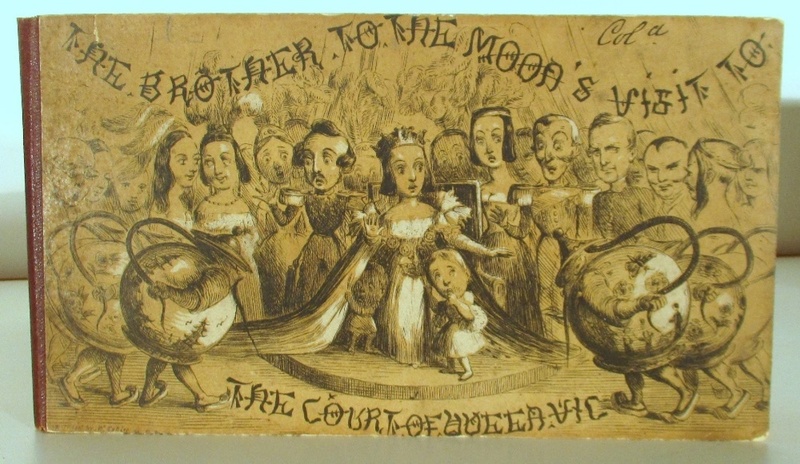 The Brother to the Moon’s Visit to the Court of Queen Vic is a set of 24 lithographic etchings by Richard Doyle which tell the story of an official Chinese delegation to London. It was published in March 1843 by H.P. & G.T. Fores of Piccadilly (the sons of the famous Georgian printseller S.W. Fores) and printed by William Kohler of Denmark Street. 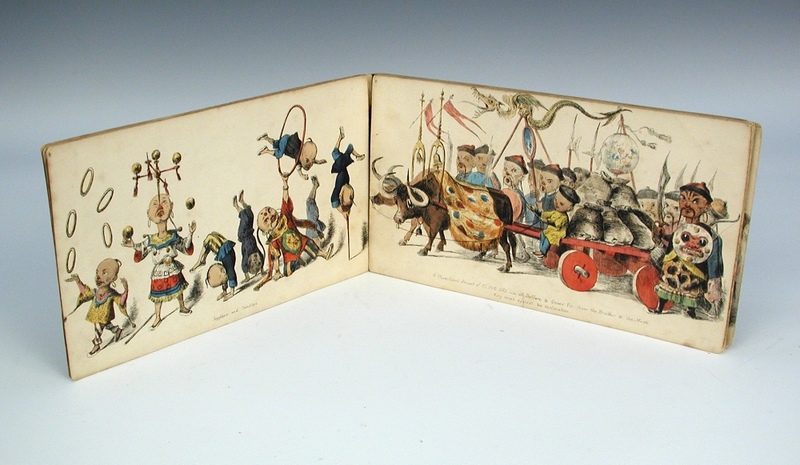 The plates depict an elaborate procession of Chinese diplomats, courtiers, soldiers and entertainers, wending their way towards an audience with Queen Victoria. Turning the pages we come across members of the ‘Celestial Guard’ and the Imperial Band as well as a troupe of performing acrobats, all skillfully engraved and finished with delicate hand-colouring. 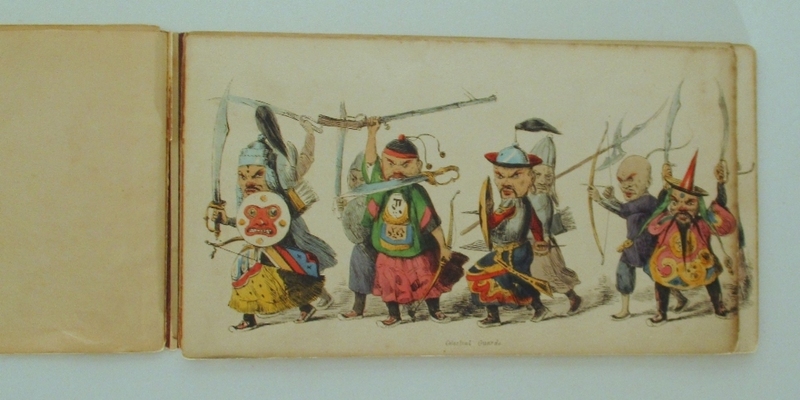 It almost goes without saying that these images are not informed by modern standards of political correctness and they play on stereotypes of Asian culture which were already well-established in British visual satire by the 1790s. In this case however the idea that the Chinese pose any real threat to Britain has been utterly overthrown and the members of the delegation are depicted a diminutive grotesques surrounded by laughably antiquated accouterments. This is hardly surprising as, six months before the prints were published, Britain had used modern weaponry to flatten the Chinese army and impose a humiliating peace treaty which ended the First Opium War. …The names of the Pantomimes are announced. The Chinese Ambassador is coming (may his shadow never be less), a great fall in the price of bread, numerous families are roaring out Christmas hymns in the streets, and the latest mail conveys the intelligence that the plum pudding is in a forward state . He then added a quick drawing of a fat mandarin his gaggle of servants to the margins of the letter along with several other doodles. The first advertisement for the prints appeared in the Literary Gazette of 11th March 1843. 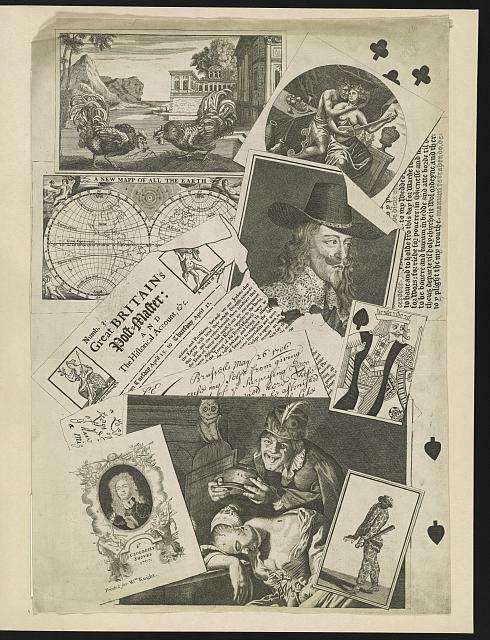 It states that the folder of prints was available from the Fores’ shop at a cost of 5s plain or 10s coloured. You’ll notice that the cover of this copy has the abbreviation “Col[oure]d written on the top, presumably for ease of reference when the folios were stacked together on the shop’s shelves. There is also an interesting flyleaf stuck to the inside of the front-cover, advertising other prints which were being sold by the Fores’ brothers at this time. 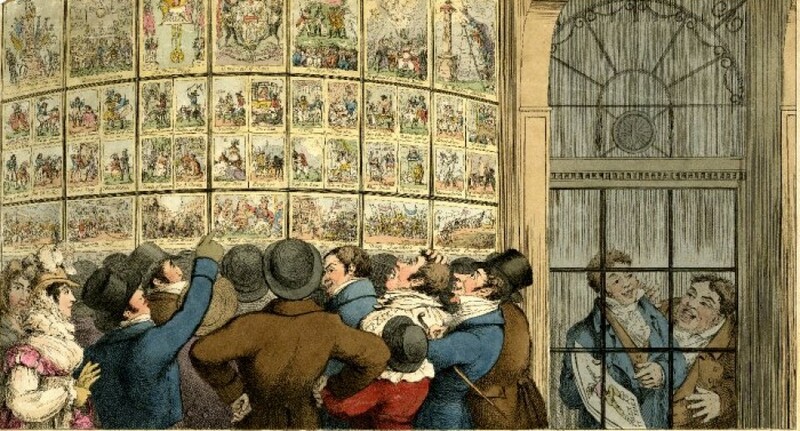 Whilst many of the titles would not have looked out of place in their father’s day, there is a notable move towards the serial publication of sets or collections of caricatures, as well as the encroachment of French prints onto the English market. G.F. Scott (ed.) The Illustrated Letters of Richard Doyle to His Father, 1842 – 1843, Athens OH, 2016. A quick post to refer readers to an extremely detailed chronological list of William Heath’s caricatures and prints that’s been pulled together by the good people at Princeton University. It’s a big file, running to almost 200 pages, and covers the entirety Heath’s career from the 1800s to the 1860s. This small oil on board painting by Jan Steen (1626 – 1679) nicely illustrates the influence which Dutch genre paintings had on the development of humorous prints and caricature during the eighteenth-century. Steen’s work is very similar in tone and subject matter to that of later caricaturists such as Thomas Rowlandson, who were always keen to celebrate the joys of conviviality and pleasure. He is thought to have painted around 800 paintings in his lifetime, many of which were translated into engraved copies during the eighteenth-century. A copy of this picture appears in the trompe-l’oeil print Great Britain’s Post Master, published by William Knight of London in 1707. As far as we can tell, the print seems to have been an advertisement for Knight’s wares and it’s therefore possible that he was selling engraved copies of the painting in his shop. Interestingly Knight appears to altered the background of the image, replacing the fireplace with an open doorway on which an owl is perched. The painting is titled The Joke, although admittedly it may not seem particularly funny to modern viewers. 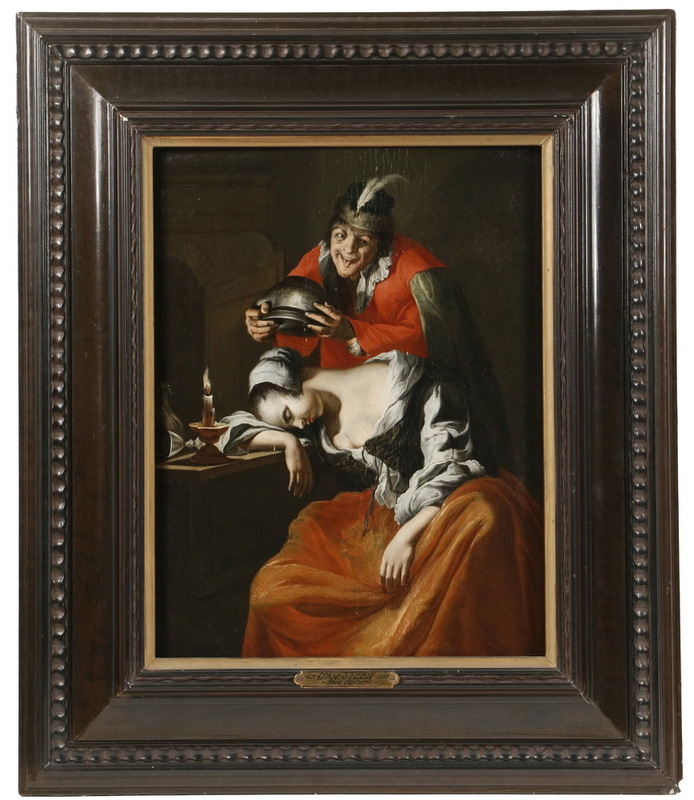 It shows a grimacing fool emptying the contents of a chamberpot over the head of a young woman who has passed out after drinking heavily. It’s been suggested that some of Steen’s humorous paintings often included a moral undertone, warning the viewer of the dangers of pursuing pleasure to excess. In this case it’s possible to discern not only the obvious threat of the upturned piss-pot but also something slightly more sinister, hinted at by the young woman’s open bodice and splayed limbs. This may explain why Knight chose to include an owl, traditionally a symbol of evil in medieval iconography, in his later engraving of the image. The painting, along with a copy of Knight’s engraving, is going on sale in the US next week with an estimate of $40,000 – 60,000.